Vasilopita (St. Basil’s Bread) This Sunday! You are here: Home / News / Vasilopita (St. Basil’s Bread) This Sunday! 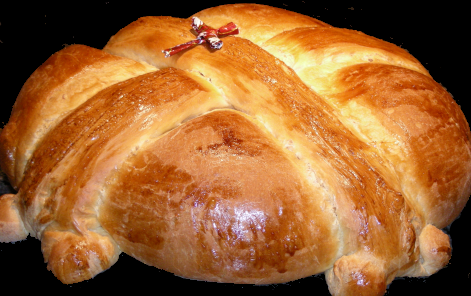 The Sunday (January 4, 2015), St. Peter's will cut the Vasilopita (St. Basil's Bread) after Divine Liturgy. The tradition of baking and cutting a special "pita" (which can mean a loaf of bread, a cake, or even a pie) each year on January 1st is observed in honor of our holy father Basil the Great, archbishop of Caesarea in Cappodocia— hence its name "Vasilopita" meaning "St. Basil's Bread." This tradition is observed in both parish churches and in the homes of the faithful. What is the meaning of this tradition and how did it begin? For centuries upon centuries, parents, grandparents and godparents have related the following to Orthodox children about St. Basil and the Vasilopita. One year, during a time of terrible famine, the emperor levied a sinfully excessive tax upon the people of Caesarea. The tax was such a heavy burden upon the already impoverished people that to avoid debtors' prison each family had to relinquish its few remaining coins and pieces of jewelry, including precious family heirlooms. Learning of this injustice upon his flock, St. 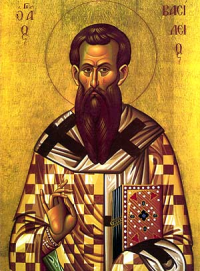 Basil the Great, the archbishop of Caesarea, took up his bishop's staff and the book of the holy Gospels and came to his people's defense by fearlessly calling the emperor to repentance. By God's grace, the emperor did repent! He canceled the tax and instructed his tax collectors to turn over to St. Basil all of the chests containing the coins and jewelry which had been paid as taxes by the people of Caesarea. But now St. Basil was faced with the daunting and impossible task of returning these thousands of coins and pieces of jewelry to their rightful owners. After praying for a long time before the icons of our Master Christ and His All-Holy Mother, St. Basil had all the treasures baked into one huge pita. He then called all the townspeople to prayer at the cathedral, and, after Divine Liturgy, he blessed and cut the pita, giving a piece to each person. Miraculously, each owner received in his piece of Vasilopita his own valuables. They all joyfully returned home, giving thanks to God who had delivered them from abject poverty and to their good and holy bishop St. Basil the Great! In remembrance of that miracle wrought by God as a result of St. Basil's love and defense of his people, Orthodox Christians have observed the tradition of the Vasilopita each year on January 1st— the date on which St. Basil reposed in the Lord in the year 379. From the Antiochian Archdiocese website. Katina Zafiris and Georgia Katsigianopoulos for baking the bread for this celebration.